Since 1989, the Leventis Municipal Museum of Nicosia, the historical museum of the capital, has been dedicated to the promotion of the history of Nicosia and Cyprus in general. Now, the Leventis Museum incorporates its permanent collections into its new venture, rearranging the temporary exhibitions area for the sake of its new temporary exhibition: “Nicosia: The birth and growth of a capital. Byzantine-Medieval period”. The exhibition will open for the public on 24 May 2018 and promises to offer an unprecedented museum experience. 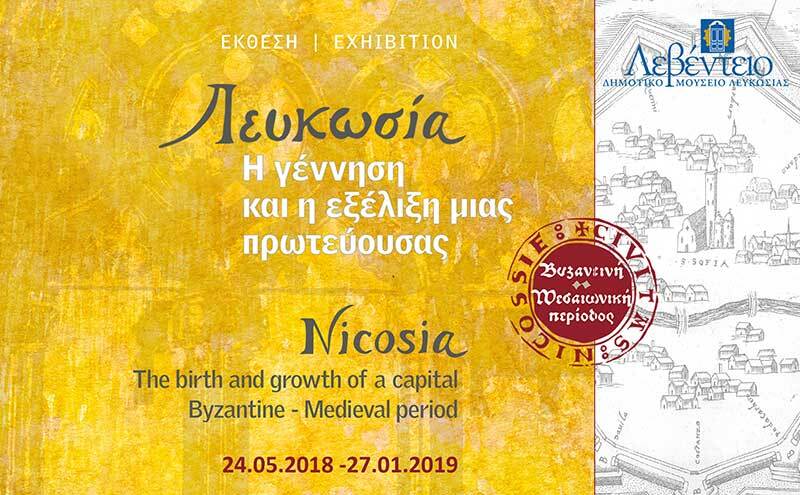 The exhibition showcases the historical course of Nicosia as capital of Cyprus since the 10th c. when, according to historical information, Nicosia undertakes for the first time the role of the administrative centre of Byzantine Cyprus. Also visited in the context of the exhibition is the establishment and development of Nicosia as capital of the feudal kingdom of the Lusignans until 1489. Cyprus then became part of the mercantile state of La Serenissima Republic of Venice, with Nicosia as the hub of Venetian rule (1489 -1570). The span of the exhibition ends at the year 1570 when Nicosia was subdued by the Ottoman Turks. The exhibition unfolds along a “magical” historical route that sets out from the very entrance to the Museum to be concluded on the second floor. Already from the ground floor in the “Orientation Room”, the public will have the opportunity to explore the Medieval monuments of Nicosia within the fabric of the present-day city, by way of a touch screen. The city’s 3D digital model also illustrates the Venetian fortifications and includes a wealth of photographic and information material. The interactive map with the Medieval monuments was modelled by the Cyprus Institute and the Leventis Municipal Museum of Nicosia. The hall is enriched by exhibits of stone architectural members from Medieval monuments. The route carries on across the first floor of the Museum’s permanent collections, in the Byzantine to the Venetian Period galleries, where among other exhibits the renowned Music Codex of Cyprus is on display. The Codex is a valuable source of information on the polyphonic music of Medieval Europe. The Codex is once again in Cyprus after six centuries since its transport to Italy as part of the dowry of Anne Lusignan, daughter of king Janus of Cyprus, after her wedding to Louis of Savoy in 1434. This precious exhibit was graciously loaned to the Leventis Museum by the National University Library of Turin for the purposes of this exhibition. Next stop, the “Medieval Ceramics Collection” and references on the existence of pottery workshops in Nicosia. The presentation continues with significant items of Gothic art. Treading the historical path, the visitor will be shown to the famed “Caterina Cornaro Gallery” that only recently was enriched by an exclusive painting. The presentation places special emphasis on the citadels and fortifications of the city of Nicosia, spanning the period from the creation of the city’s first Byzantine castle to the construction of the Venetian walls. The “mapping” of events then takes the visitor to the Museum’s “Maps Collection” featuring books, manuscripts and other items of particular historical significance regarding Nicosia’s siege by the Ottomans in 1570. Helmets, swords, bullets and representations on engravings invite the visitor to “experience” the historical turning point of the 9th of September, when Nicosia passes from the hands of the Venetians to the hands of the Ottomans. The exhibition unfolds on the museum’s second floor, in the “Temporary Exhibitions Hall”, highlighting various aspects of Byzantine and Medieval Nicosia. People, institutionsandlegislations, Religiouslifeandart, Life in the city and at home are the main exhibitory units that make up the historical setting within which the visitor will follow the city’s growth, structures and human activities. Here, one may examine and admire coins, rare books, pictures, tokens of remembrance, household items and other “treasures” of Medieval Nicosia. For the purposes of the exhibition, the Leventis Museum has borrowed items from State bodies, museums, cultural foundations and private collections: Turin National University Library, Cyprus Department of Antiquities, Byzantine Museum of Archbishop Makarios III Foundation, Bank of Cyprus Cultural Foundation, Pierides Museum- Bank of Cyprus Cultural Foundation, Cyprus Folk Art Museum of the Society of Cypriot Studies, Museum of Kykkos Monastery, Demetris Michaelides Collection, Michael Zeipekkis Collection, Andreas Georgiades Collection and Andreas Demetriades Collection.